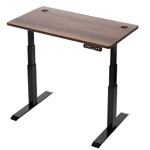 The StandDesk Pro is a good economical option, and features a longer warranty than any other Chinese-made desk. The StandDesk was created by millennials, is marketed straight at millennials, and has been gobbled up by millennials in impressive volumes. While it carries a ten-year warranty (the longest of any Chinese-made base), in this case it's not necessarily a reliable indicator of the expected useful life of the lifting columns. But for the price, the StandDesk is a great lower-cost alternative to the UpLift, Jarvis and other Chinese-made desks. Despite its stability issues this is a far better product than the Autonomous SmartDesk or IKEA Bekant could ever hope to be, and a good value overall. It's the mid-priced offering in the broad category of Chinese-made desks that is winning over customers from both its cheaper and pricier peers. Due to stability concerns we presently narrow our recommendation to users who are not too tall and don't intend to use a desktop wider than 60", at least until StandDesk improves their crossbar design with the new StandDesk Pro v2.0 that is supposed to be released very soon. Configured with a 27"x60" black desktop and digital hand controller with four programmable height presets the StandDesk comes in at $550. But you can get out the door with a minimalist 24"x45" black desktop and simple two-button controller for only $480. Ten years on the base components, with lifetime on the steel frame. Desktops are not included in the warranty. Varies by desktop type. Smallest is 45" x 24"; largest is 72" x 30" but only in reclaimed wood. Black, white, natural or light bamboo, reclaimed wood, natural wood (American black walnut), "wood finish" (sort of a walnut). Spec is for 400 lbs though we could get it to reliably or smoothly lift anything near this weight in our testing. Simple product, simple buying process. Limited desktop choices still offer a sufficient range of options for buyers who aren't trying to match a specific decor or space. Vanity tops like natural wood or reclaimed wood are half the cost of what Fully and Human Solution charge. Ten year warranty is better than offered on any other Chinese-made base. Nice looking full-color manual with clear instructions for how to clear error codes. Weaknesses in crossbar design lead to instability with very large desktops and for taller users, although an optional stabilization bar (which we weren't provided for testing) that StandDesk sells for $50 more should improve stability. Warranty does not include desktops. Assembly is quite involved, as it is with most any Chinese base that arrives as an "IKEA kit." Specs say it'll lift 400 lbs but we encountered numerous faults just trying to lift 355. There is a slight sync problem between the left and right motors that causes the desk to wobble every time it starts to ascend. A good, lower-cost alternative to the Jarvis, UpLift and other Chinese-made standing desks. For those who don't need a lot of height range or intend to use a desktop wider than 60" the stability issues of the design will not be noticeable. 10-year warranty is much better than pricier Chinese-made competitors, although like their peers desktops are not covered in the warranty. This product has been through several generations of improvements and more refinements are on the way, we are told. 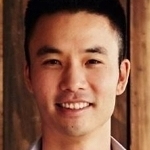 We’ll get into the details of our Stand Desk review in a moment, but first a little background on the Stand Desk company and its CEO, Steven Yu. Perhaps as close as it gets to a celebrity in our industry, Yu was first guy to launch a low-cost standing desk that raised $650K on Kickstarter. A confident, business-savvy millennial, Yu saw the opportunity to exploit the standing desk market by selling budget standing desks to other millennials who just couldn’t afford a $1000 standing desk. Leveraging contacts he made in China while living there to earn his masters degree in economics from the University of Science and Technology of Beijing, he came up with clever ways to cut costs out of a standing desk and be able to offer it to the American consumer for only $399. This was back in 2014. We’re going to be brutally honest, as Steven was when we first interviewed him at the ErgoExpo conference in Las Vegas in 2016. He had found out that it’s pretty hard to build a reliable desk, even with the best factory connections in China, for $399 retail. Early versions of the StandDesk experienced a variety of quality issues that made for some hard lessons. No surprise, the product had to be priced up a bit over time to include better quality components. The StandDesk Pro is at least the third iteration of the design. Over the next four years, Yu would continue to make changes to his product, sourcing better vendors and continually pressuring them to beat out any flaws in the product. Remarkably, he did so while building an impressively large and loyal customer base, and maintaining profitability. One thing he’s done to accomplish this is to leverage overseas employees wherever he can, keeping only a handful of essential personnel in the company’s Los Angeles headquarters. Not bad for a former mortgage broker with no manufacturing experience. Another nifty “growth hack,” as the millennials call it, was naming the company after the generic term most people would use in search engines to find themselves a height-adjustable desk. Note the domain name is StandDesk.co (not .com), which most people never notice if they get to it through a Google search. Yu claims a third of his business comes to his company this way, so that wins an A+ for cleverness. What the company lacks in trademark protection, it more than makes up for in zero-cost customer acquisition. But enough talk about business. We’ve continued to track Steven’s progress and recently gave his latest version of the product, the Stand Desk Pro, a full lab review. Truth be told, we held off reviewing the Stand Desk for a couple of years until Yu gave us the high sign that his product was really ready for prime time. While it didn’t pass every test with flying colors, it is clear that Yu has made countless small improvements over time that render obsolete some of the early negative reviews that the product has received. Note that the base we tested is the StandDesk Pro, launched in August of 2017, as opposed to the StandDesk Simple that you might have seen reviewed elsewhere… there’s a stark difference in refinement between the two. 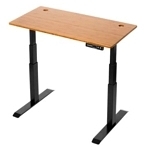 The StandDesk Simple standing desk model was discontinued upon the release of the StandDesk Pro. We’re pleased to finally be able to publish our lab testing on this product because it’s an important contender in the boundary zone between the super-cheap, super-bad, Chinese-made desks like the Autonomous SmartDesk, and the next step up in Chinese-made desks—most notably those built atop the Jiecang standing desk base like the highly popular UpLift and Jarvis standing desks. A minimally configured StandDesk Pro with a 27″ x 60″ black laminate desktop and full digital hand controller comes in about $80 cheaper than an equivalently-configured Jarvis or UpLift with a 30″ x 60″ top. To be clear, we’re talking about a relative scale of one Chinese-made standing desk versus its peers. American-made options are of substantially higher quality and slightly higher cost, but would make an unfair comparison here. If you want to learn more about the differences see our Comparison Review of American-made Standing Desks. A point of distinction up front is that Jeicang has been selling their commodity electric desk bases to a good number of resellers in the US probably longer than any other Chinese factory. Their OEM customers are typically online ergonomics retailers looking to build an exclusive house brand standing desk line to maximize their profit margins, but without getting into the difficult task of designing their own and finding a competent factory to make it. It’s much easier to buy the base as a kit and have it customized with your graphics, or perhaps with a couple of unique hardware customizations to make your base look a little different from your competitors’. Jeicang bases can be found under the Ergoprise S2S, GeekDesk, and numerous other lesser-known standing desks, not just Fully’s (Jarvis) and Human Solution’s (UpLift). As such, there is very minimal differentiation among these vendors beyond the desktops they bundle with the bases to create their desk offerings, and you can read all about that in their individual reviews. Given that the Jiecang is the most commonly found Chinese base in the wild, we are going to use it here to compare the quality of the Stand Desk Pro base. We could also compare it to StandDesk’s arch competitor on the low end of the scale, the Autonomous SmartDesk, but that would be no contest. You can read the SmartDesk review to learn why we gave it the lowest possible rating that we’ve ever given a desk (though it’s a bit of a toss-up with the IKEA Bekant for worst desk being sold today). Most every standing desk maker picks one base vendor and builds all their desk models off that one platform. Few make their own. Humanscale is one example with their premium, American-made Float Table with its unique counter-balance mechanism. And iMovR (a company we’re indirectly affiliated with here at WorkWhileWalking) stands out as a truly agnostic manufacturer since it has utilized highly-customized versions from not one, but six different base factories (though recently all Chinese-made bases were dropped from their product line as they’ve chosen to go all-American). We have a lot of people around here who have spent years testing standing desk bases, whether in reviewing products for WorkWhileWalking or in evaluating possible candidates to recommend to iMovR as new desk models. In full disclosure, the StandDesk Pro was originally sent to our sister company iMovR to evaluate as a possible OEM component for a new, lower-cost desk line to complement their American-made models. We here at WorkWhileWalking borrowed it for this review. In the end, neither the StandDesk Pro nor the Jiecang, for that matter, ever made the cut; iMovR’s standards for adjustment range and stability are different (and higher) than any other standing desk manufacturer. Why’s that? It’s because of the number of people who use iMovR standing desks in treadmill desk configurations, which require extra tall maximum heights and stability in the upper ranges. But again, we’ve re-run our lab tests on the StandDesk to specifically compare it to its peers that also employ Chinese-made bases. Lift capacity: At a published lift rating of 400 lbs versus Jiecang’s 350 lb rating the StandDesk Pro would seem to have Jiecang beat, but we had issues getting both bases to perform properly at the specified max weight. Their specs are simply overblown. Transit speed: Comparable at 1.3 inches per second. Hand controller: Both offer either simple 2-button up/down controller or upgraded digital controller with height readout. Jiecang has four programmable height presets, StandDesk has three. See more below. Foot/Leg design: StandDesk is all-steel, as are most Jiecang models except for UpLift—which uses lightweight aluminum feet, resulting in inferior stability. The StandDesk is an old-school “T-leg” design versus the cantilevered “C-leg” of the Jiecang and most other modern electric desks… see discussion below. Crossbar design: This is the biggest knock on the StandDesk Pro, see below. Stability: Not as good as the Jiecang, which isn’t saying much… see below. The hardest things to get right when designing a standing desk base are the proper amount of “deflection” in the lifting columns, the strength of the crossbars and the structure of how the crossbars are welded to the lifting columns (usually intersecting at the motor housing). These three things along with the weight of the feet will determine the stability of the entire desk. By the way, if you want an extensive discussion on standing desk stability, you can read our article “Why Some Standing Desk Shake More Than Others“. Like most standing desks, this one is made of steel. UpLift skimps on the their feet by using aluminum to keep materials costs and shipping weight down, which costs them in stability. Other Jiecang resellers like Fully also use steel feet for extra stability. Let’s talk about “deflection.” That’s a fancy engineering term for how much slack there is between the telescoping tubes of the lifting column. When designing linear actuators this is the hardest thing to get right. Too much deflection means the gasket, or “glide” separating the tubes is too loose, resulting in a shaky desk and excessive wear-and-tear. Too little deflection means the tubes are too tight, creating too much friction and causing premature motor failure (or automatic cutoff from the current load sensor in the controller), or at best high energy consumption and possibly more noise and vibration, plus excessive wear-and-tear. We’ve taken our share of tours of linear actuator factories both in the US and Asia, and we’ve seen how perfecting some manufacturers can be in designing single-micron laser-cut precision into their production processes. Some American manufacturers even go so far as to measure each tube and glide that comes off the production line, to the micron, and matching up the best fitting pieces. They do this because there are precision tolerances of +/- one micron or two even on the most advanced steel-bending and cutting equipment. And then they test the final assembly of the lifting column to make sure that each leg leaving the factory is within very exacting specifications. In most Chinese factories nothing like that is happening. It simply costs too much to build that kind of quality control perfection into a linear actuator assembly line. That’s the biggest single difference between Chinese-made and American made. Without getting into any further boring minutia, we can conclude by saying that the StandDesk Pro still has work to do in the deflection department. As for the crossbars, we have to say that the StandDesk Pro’s are not the best we’ve ever seen, not by a long shot. The design needs work to make the connection between left and right crossbar ends more solid. 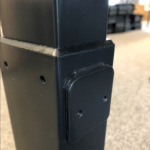 No matter how hard we tightened the flat-ended screws against the U-curved crossbars, we couldn’t get the frame to stay square when lifting it from the middle. And that means that the frame isn’t adding any stability to the stiffness of the wood desktop. The result is a predictably shaky desk once you raise it beyond about 40″ of height (if you’re 5’5″ tall you probably stand at around this height) or add a tabletop wider than about 60″. The digital hand controllers are very different between the Jiecang breed and the StandDesk. To be candid, both have the same cheesy plastic aesthetics as is common with Chinese-sourced controllers, though StandDesk’s is a little more modern looking. Both claim the same electronic features including four programmable height presets, anti-collision & sensitivity control, overload protection and overheat protection. Unfortunately both controllers had issues when testing the specific limits of the desk, even at less than the maximum load (400 lbs for StandDesk, 350 for Jiecang desks). These limiters are in place so that you don’t accidentally burn out your motor(s) by overloading them or exceeding their duty cycle specifications. Both have the same 10% duty cycle limitations, allowing two minutes of continuous up/down operation before requiring an 18 minute rest for the motors to cool down. None of these desks could go a full two minutes even with far less than max loads. But clearly StandDesk has put more thought into the user experience, and has much clearer and easier-to-read instructions on how to recover from error modes. But errors we did get, repeatedly. Another oddity is that on ascent the motors start off slightly out of sync, causing the desk to wobble every time it starts upwards. The wobble settles out after a couple of inches of movement. Like the Jiecang desks, the StandDesk’s motors start to slow down and whine louder as more weight is added. As with most things, you get what you pay for. While the StandDesk Pro is a bargain compared to the Jiecang-based competition, it doesn’t perform as well at the margins. If you’re not a particularly tall person, and your desk isn’t particularly wide (60″ or narrower) you will probably never notice any instability. 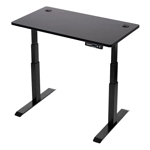 The StandDesk base opens up 11″ less than the Jiecang horizontally, so 80″+ tops are out of the question for sure. If you’re on the taller end of the scale you may be better off with a competing product; and if you’re really tall (or plan to use an office treadmill) you’ll want to look into a desk with leg extensions (extending the top end height to 55″) like iMovR’s, which none of the Chinese base manufacturers—or American ones, for that matter—offer as an option. The plate welded to the back of each lifting column is for affixing a “stability bar” to reduce the shakiness of the desk, but this option seems to have been discontinued. StandDesk sells a stability-enhancement bar for this base that runs between the bottom tubes of the lifting columns, about 18″ off the ground, as a $50 upgrade. We did not receive one to test, so we can’t comment on its effectiveness in reducing the inherent instability of the frame, though we did read one person’s online review who commented that the stability bar didn’t do much to reduce the shakes. And that’s not particularly surprising given that there are other factors at play that contribute more, like the deflection in the lifting columns and the weak crossbar arrangement. These “shin-crusher” bars were designed out of most desks years ago (GeekDesk and a few others are still lagging in this regard), placing heftier crossbars directly under the desktop, and out of site, in lieu of the visible and annoying stability bar, but if you want to reduce the flex in the parallelogram that is a standing desk, it is one measure for doing so. Boldly, StandDesk offers a lifetime warranty on the frame and ten-year warranty on the mechanical and electronic parts. This is much better than Fully’s and Human Solution’s seven-year warranties, and on par with the warranties iMovR offers on all their desks—with the exception that only iMovR offers warranties on its desktop for five years. StandDesk, like its peers, offers no desktop warranty. Usually, we say that the warranty term on a product should be a good predictor of its useful life; in this case we can’t really say that, and hence why we think its a bold move for Yu to offer it, but he has by now built a long reputation of standing by his product. StandDesk claims their motors have been tested to a ten-year life but we know that real world conditions are often harder on standing desks than laboratory test fixtures. Still, for a $399 base getting a ten-year warranty is a very big plus. 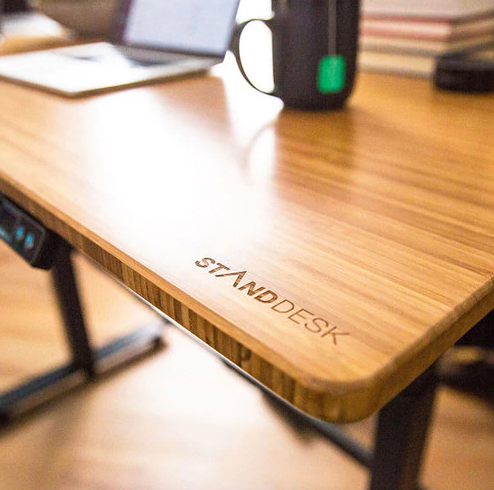 StandDesk.co is not the Fully, UpLiftDesk or iMovR website, with their plethora of desktop options in a vast array of materials, colors, shapes and sizes. There’s no three legged version of the StandDesk Pro, or L-desk or pork chop desktop. It was designed to be simple, and for users to get in and out of the website quickly, without a paradox of choices to make. But you also have the option of buying the StandDesk Pro base standalone for only $399 and add your own desktop. As such, they have anywhere from one to four sizes available for each of their various desktop options, including basic laminate, bamboo, natural wood and reclaimed wood. If you find something that matches your decor and space, great. If not, you may have to look to one of their competitors for more options. The most basic desktop is a standard high-pressure-laminate (HPL) on particle board, available in only black or white. Size options include 45″ x 24″, 50″ x 30″, 60″ x 27″ and 60″ x 30″. The last two are a bit of a puzzle as there’s an $80 difference for the extra 3 inches. With the smallest size top and a simple two button controller you can get out the door with a StandDesk Pro for only $479. The bamboo is offered in two tones, a light bamboo and a carbonized bamboo they call “natural” tone. We normally get on a scree right around here about the fraudulent marketing of bamboo as an environmentally-conscious choice, when it point of fact bamboo is the least environmentally sensible desktop you could choose. The only good news here is that unlike Fully, UpLift and some others, Yu’s website doesn’t go on and on with hyperbole about bamboo being god’s gift to the environment. In fact, StandDesk.co‘s website is extraordinarily terse compared to most all of their competitors. There isn’t much to read by way of specs or outlandish marketing claims. So there’s also not as much for us to challenge on the truth-o-meter as compared to the Jiecang-based desk sellers. 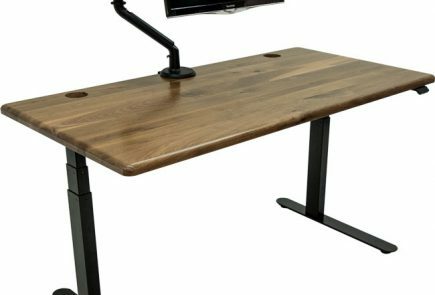 What StandDesk calls a “wood finish” looks a bit like walnut, perhaps, and comes in only one size, a diminutive 45″ x 24″. It’s a $20 upgrade over the plain black or white desktop in the same size. This is a compact desk, for certain. It may be a good fit for cramped NY apartments or a call center where you want to squeeze a lot of people into a small space. The good news is that at this size there is little to be concerned about the desk’s stability. Reclaimed wood comes in only one tone but three different sizes: 45″ x 24″, 60″ x 30″ and 72″ x 30″. This is the only desktop that comes in this largest size of 72″, but as we’ve stated elsewhere we have our concerns with stability of the desk with large, massive tabletops at height. The good news is this wood plank is very thick, adding to the stability of the desk. Upgrading to reclaimed wood adds $250 to the cost of the standalone base. Lastly we come to the natural wood option, with according to a company representative is American black walnut. It only comes in one size – 60″ x 30″ – and one color tone. At $550 this top costs substantially more than the base it sits on, but this is about half of what Fully and Human Solution charge for their hardwood tops. StandDesk puts an ergo-contour on the user edge of the wood desktop, and along the back edge as well, giving it a distinctive look. We had been told that a lot of attention was paid to making the StandDesk Pro easier to assemble, so we handed it to a brand new employee who had never built a standing desk before and professed to being not particularly mechanically inclined. Indeed there were some nice touches in the assembly documentation, almost like a paint-by-numbers procedure. However, like most every Chinese-made base we’ve ever seen (excepting the Varidesk Pro Desk 60 Electric) the process took about an hour, with a little assistance from some of the old hands. Overall, we can’t say that the process of assembling a StandDesk Pro base was a dramatic improvement over the competition because unless you’re a DIY type of person, it’s still going to be an arduous task, just like assembling IKEA furniture. Assembly involves 30 bolts plus eight wood screws. We did have some challenges with bolt hole alignment, which again is not uncommon with Chinese-made bases that aren’t built to the same manufacturing tolerances as American and European bases are, as a general rule. If DIY is not your thing, consider a vendor with pre-assembly as a delivery upgrade option, or go for a desk that’s practically pre-assembled like our partners have over at iMovR with the Lander. Like all the Chinese bases we’ve tested in our labs, we have to narrow our recommendation on the StandDesk Pro to shorter users with narrower desktops, as the stability just isn’t there for a large mass elevated high off the ground. American-made desks will be better suited to these applications, and for a fairly obvious reason. Virtually all American-made bases are made in US factories that are owned by Swedish, Danish or German companies that invented this industry, and their average citizens are a lot taller than the average Asian consumer, so they started making longer-stroke lifting legs a long time ago. And they have far more robotic automation, laser-cutting equipment, and sheer experience making standing desk bases, needless to say. But if you’re not too tall, don’t have an inordinate amount of heavy equipment on your desktop, and don’t need too wide of a desk, the StandDesk Pro will give you good bang for your buck. All that might change with Yu’s promised StandDesk Pro 2.0 design that he expects to release around August or September—so stay tuned for an update. The new design is supposedly going to be much easier to assemble and have a heftier crossbar design, among other refinements. It will be offered in both a “T-Leg” and “C-Leg” configuration, alleviating our concern about side-load stressing on the lifting columns. Be sure to check out our comprehensive round-up of all the popular adjustable height desks in our Best Standing Desks review. Subscribe to our free newsletter to stay abreast of all the new product reviews in office fitness. Our company purchased 6-8 desks over the last few years. They are all failing at this time and we have not had any resolution to fixing the problems. the lifting mechanism do not go up or down at the same time. this leaves your desk tilted to one side. They sent replacement parts that were for a different model and would not fit. The second attempt at sending complete lifting assemblies we found that one of the motors did not work. Response form Donna (i think she is the only customer service rep) was sporadic. We finally asked for credit back since they were under warranty and they refused. At this point we had been trying to resolve the problem for over 9 months. As of today i have informed her we are going to scrap the desk and cut our loss. Note that they will not post any negative reviews on their website. I had to resort to the BBB and Google Maps review to get this out there. There are other reviews on Google Maps of customers with the same problem. BTW I have yet to have them answer their California phone number for any department listed including sales. They want you to leave a voice mail and they will return your call.